Emails and tweets went out to those who subscribe to OnePlus, branding the reveal as "Focus on What Matters." 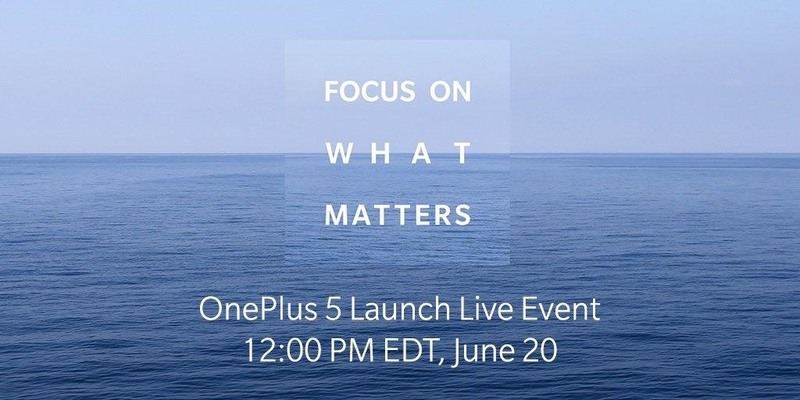 It tells consumers to prepare for an online, live streamed event that will take place at 12 PM EDT on June 20 followed by pop-up events around the globe releasing the new phone. The wait has been agony for OnePlus fans. The company started as a small startup phone company that began to create phones similar in quality to iPhones and Android flagships, but not quite so expensive. The release of OnePlus One three years ago was a hit, with OnePlus 3 and 3T following as favorites. Aside from the release date and the OnePlus 5 being confirmed to have a Snapdragon 835 chipset, OnePlus is keeping pretty much everything about the new phone under wraps. However, popular rumors surrounding the OnePlus 5 include the phone being smaller in size than the 3T having dual cameras, and crazy color options, including a gradient colored phone.